Cryolipolysis can treat multiple areas including; upper and lower abdomen, bra and back fat, flanks, banana roll, inner and outer thighs and upper arms. The Coolsculpting device process gets to -10° to freeze fat cells at their controlled, safe freezing point of 4-6°, this consequently causes them to die (apoptosis). As the body expels these cells naturally, Coolsculpting results begin to show. In conclusion, you should notice a difference after 3 weeks. Sometimes the improvement and final results are not apparent until three months post treatment. Tips for obtaining the best and long lasting results! 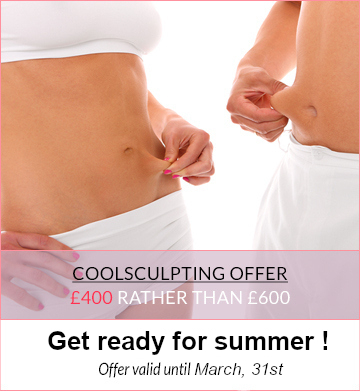 These would include ensuring you are combining the treatment of coolsculpting with a healthy diet & lifestyle. We recommend to drink plenty of water and, in addition, carry out daily excercise to encourage the lymphatic system to flush the dead fat cells out of your body. No preparation time: There is no requirement for fasting or preparing for surgery since the treatment is non-invasive. You can simply come into the clinic as you are and get the treatment done. No downtime: You don’t need to worry about any downtime, you can go on with the rest of your day after the treatment without any issues apart from some very mild redness/discomfort. It’s practically pain free: Besides being a little cold on the area the applicator is treating and some slight suction sensations, there is no pain during the overall CoolSculpting process. Many people enjoy watching Netflix on our iPads, reading a book or take a nap while the treatment is being performed.